Magnifico coffee table ... square top. OKHA Studio says its new Magnifico coffee and side tables visually represent the multi-cultural charm of its South African locality through their marble top. The pair of hand-crafted tables, available in varying sizes and weights, have been designed by Adam Court, sole designer for the luxury artisanal brand, who fell in love with the Verde Magnifico marble when he saw it. “The stone’s visible layers of history speak to Okha’s South African locality of cosmopolitan, polyglot and multi-cultural charm,” says a spokesman for the brand. Court conceived Magnifico side and coffee tables together. “Their shape of perfect triangle and perfect square cut off at the edges are testament to the vast natural geologic surroundings of Cape Town and South Africa which inform Okha’s design process and choice of materials,” he adds. 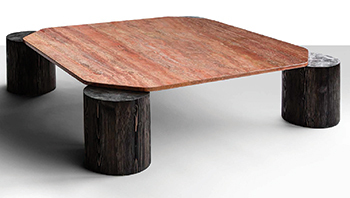 The Magnifico coffee table’s Mars red Flame Travertine distinctly reveals the original sedimentary layers, most likely deposited by hot springs. The top of the coffee table straddles the muscular larch timber legs, effecting a beautifully bizarre and primitive cosmic landing pad, the spokesman remarks. Made from the wood of the larch tree, the table legs are over-scaled, intentionally exposed beyond the table top edge to produce the concept of weight pushing down in a playful over-exaggeration. “The shape of the side table brings to mind ancient symbolism and ritual, the materials and forms both speak of ancient cultures and other worlds,” he says. Triangular in shape, the top of the side table it is crafted from Verde Magnifico marble, from which the collection gets its name. Hexagono Emerald tiles from the Amazonia collection. 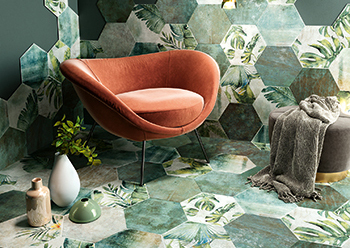 CTD Architectural Tiles of the UK says its new Amazonia collection is guaranteed to bring any residential, commercial or hospitality project to life by combining rustic handmade influences and the trend for contemporary biophilic design. “Versatile and unique, Amazonia combines botanical patterns with a pared-back, nature-inspired palette to enliven spaces of all sizes,” says a spokesman for the company. Suitable for both walls and floors, the tiles are available in two shapes: a small square format (138 x 138 mm) and a larger hexagon format (320 x 368 mm), in five colourways and designs. Offering vast opportunities to combine and mix the distinctive tiles, CTD Architectural says the collection enables customers to choose from the subtle geometric patterns of Ethnic or the delicate leaf prints of the Tropic designs to create a standout space. ”From bars and restaurants to retail spaces and even swimming pools, Amazonia offers a truly versatile tiling proposition to designers, specifiers and architects,” the spokesman adds. 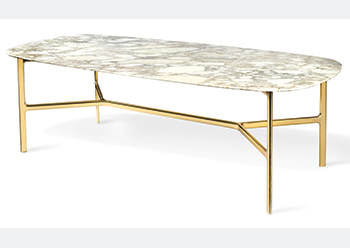 Coast Table ... brass structure with the top in wood, marble or crystal. GHIDINI1961, a high-end manufacturing company renowned for its brass accessories, has entered the world of upholstery and furnishing with the launch of the Katana sofa by Paolo Rizzatto and the Coast Table by Branch Creative. In the Katana sofa, designer Paolo Rizzatto has put great care into the proportions of the structural elements of the product. “In the elliptical leg, every millimeter has been designed and calibrated, as well as the relationship between seating and structure,” says a spokesman for the Italian manufacturer. The sofa, he says, refers to the iconic and seductive shapes of the classic Chesterfield, reinterpreted with renewed elegance. This makes it enveloping and comfortable, its height and width support a relaxed sociability. Featuring Kvadrat or Dedar fabrics or natural leather upholstery, the sofa is finished in brass (polished or satinated). Meanwhile, the Coast Table has been created by the San Francisco-based design studio Branch Creative in line with its philosophy that products should have a positive and lasting impact. With a silhouette that is both architectural and organic, the table’s refined brass frame and sculptural joinery support a table top that has had all sharp corners softened. The table has a brass structure with the top in wood, marble or crystal.